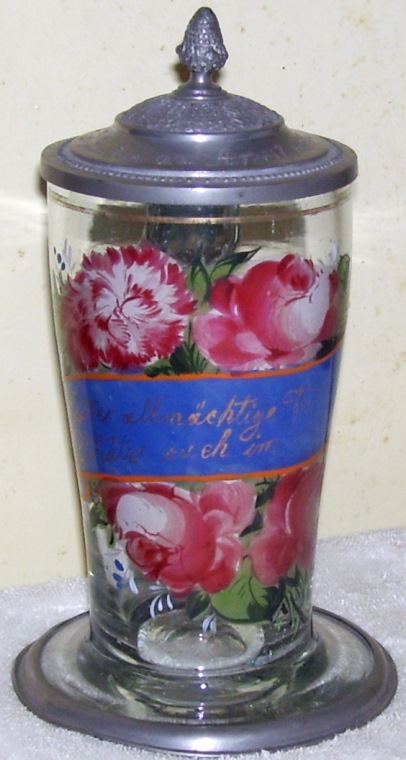 A very nice example with its red ribbon scrool for the saying and a great wide base with ring. A decoration style seldom seen. 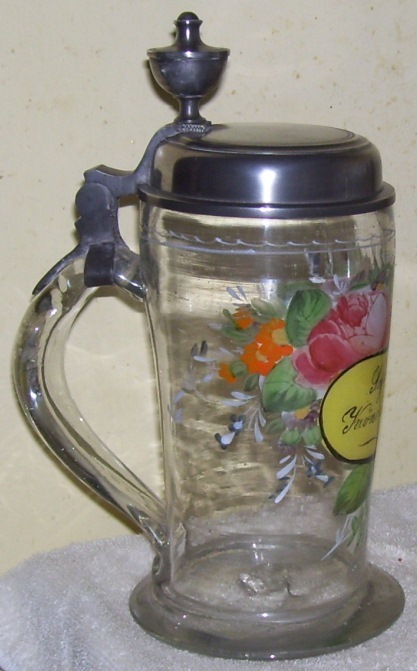 This one could also go on my: “Not your average drinking vessel. I do wish some of these were mine” page. 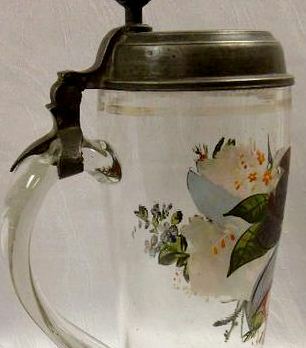 Saxon “wedding stein” – no date on the piece, but circa 1830-50. Detail of how “undisturbed” gold lettering should look like. 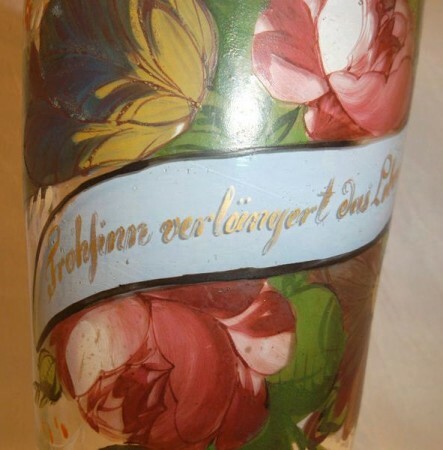 Detail of how the painted flowers look from the outside inward. Detail of a typical Saxon glass stein’s lid from the period 1830 -1850 showing a large “Urn” thumblift and a single ring of embellished pewter on the lid. This also shows the thick flattened handle which are much sturdier than those of the 1700’s, and it reduces in size at the base where it attaches to the body. 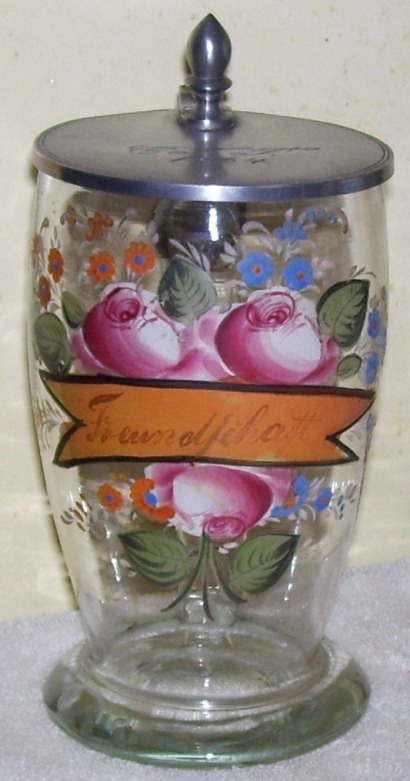 These blown clear glass steins were made throughout Saxony and some surrounding areas from about 1830 through at least 1865. Each is decorated in bright enameled colors and for additional highlighting are also painted on the inside body as well as the outside. The inscription car touches range from scrolls, small and large circles and are done in various colors. Roses appear to be the dominant flower depicted, at least on the earlier ones. 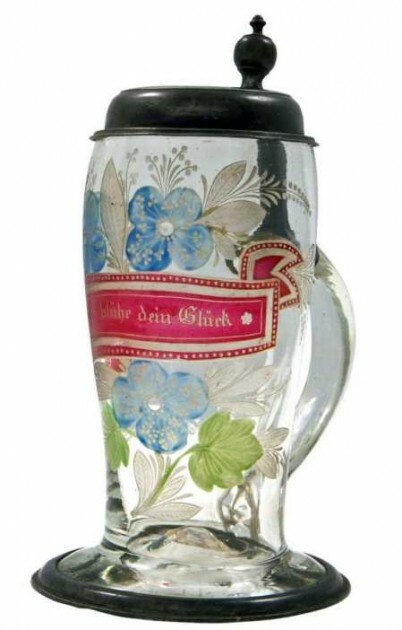 While called “Wedding steins,” by most collectors this is not necessarily a true description, as they were also given as “friendship gifts” as well as a mementos for the newly married couples. 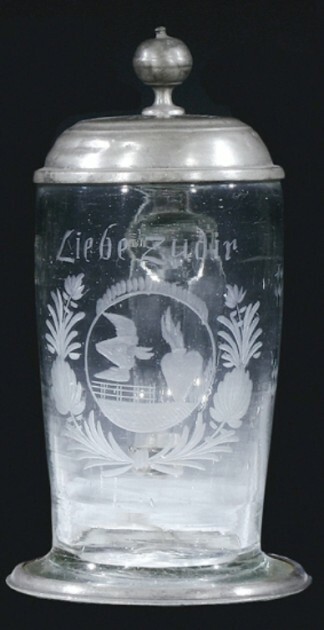 In his catalogs the Munich stein auctioneer J. Vogt described one of these as a Sachsischer Hochzeitskrug” or a “Saxon high celebration” stein. 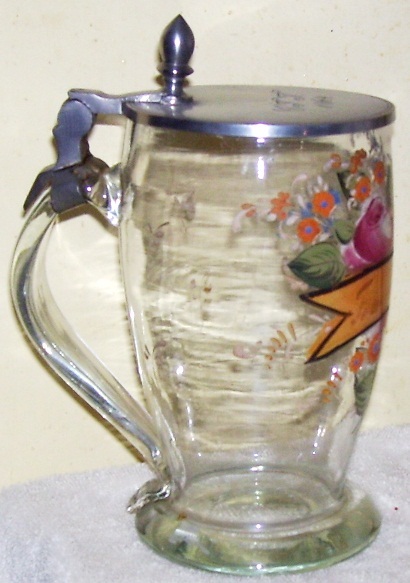 He also used the description “Kindstaufenkrug” – meaning essentially “child’s birthday presentation stein” on one of his pictured Saxon steins. So if we were to call these “Celebration steins”, I think that would be more than appropriate! 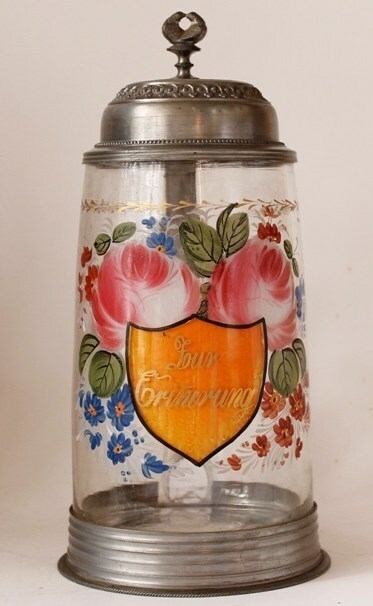 One liter blown clear glass stein with a copper wheel engraved Royal Coat of Arms of Saxony. Circa 1830, and from Saxony. 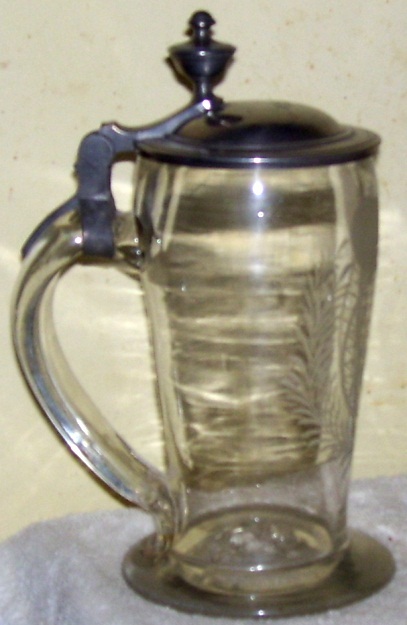 Over the years I have heard these type steins also called “Alpiner” or “Tyrolian” steins, which is very incorrect, as the Kingdom of Saxony was nowhere close to ‘The Alps’. 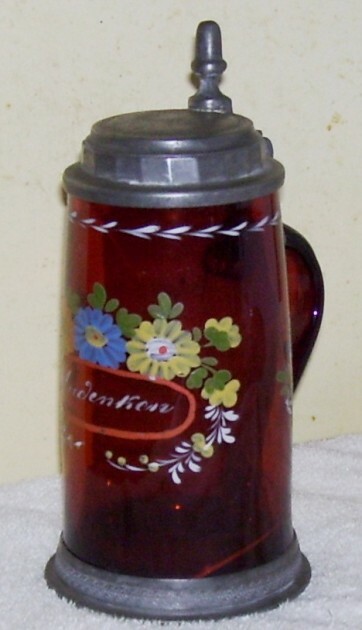 They have also been called Beidermeier” steins which is more a reference to the time frame in which they were made and not the area. 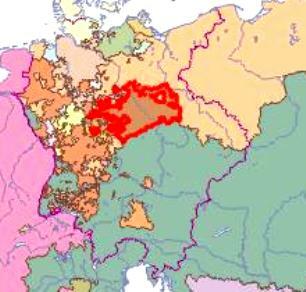 SAXONY (Central Germany) in 1800 – Map courtesy of ‘EURATIAS’, Copyright 2009. 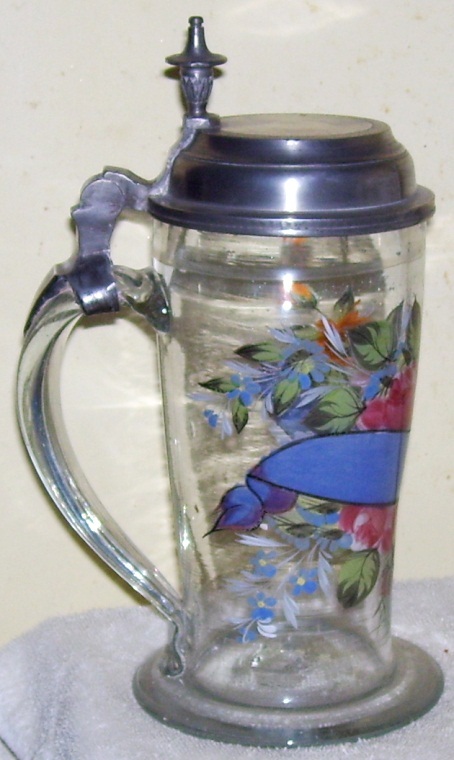 These all hand blown glass and hand decorated steins are much more appreciated in Germany than here in the USA. 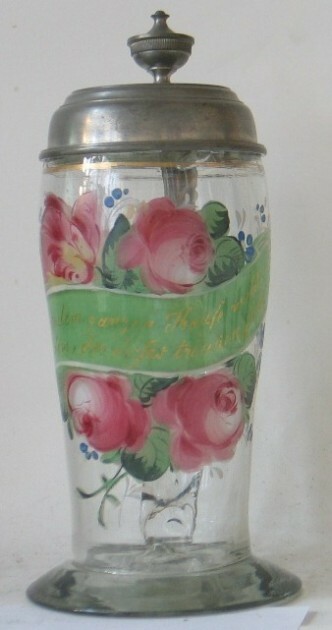 This example, dated 1858 (a late date for this type lid, perhaps this is a local attribute?) with lots of “pink” roses; sold for $794.00 in September of 1998! An enigma! While this small “urn” finial looks like it may be later than the larger ones = 1850’s, these are mostly seen on steins from the 1800-1815 period. But it also has a tiered lid indicating a later date. 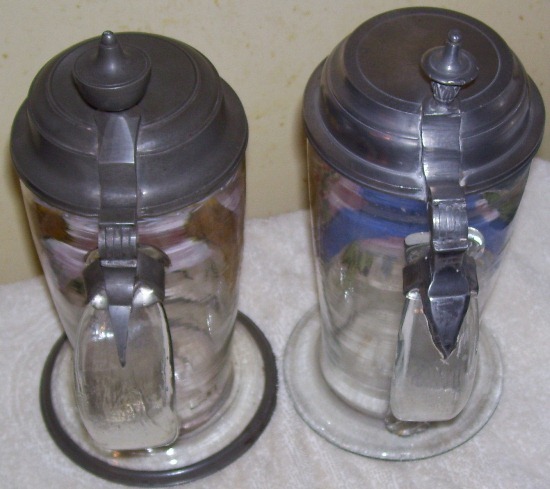 I’m going to go by the lid (as thumblift molds could be laying around for years) and my SWAG says it is circa 1855-65. Another with the pewter base rim. It is hard to read the gold leaf inscription on that dark yellow background. Circa 1830. 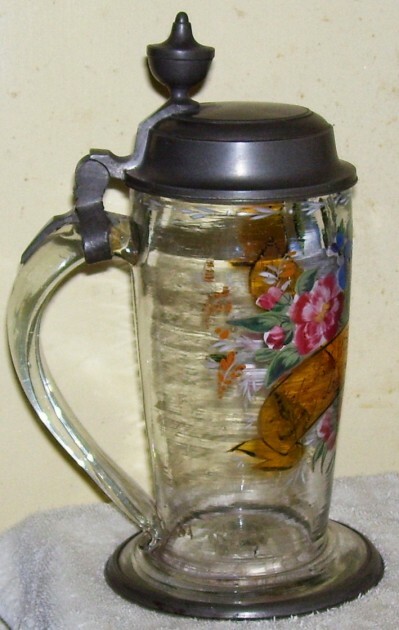 A close up of the” lid to handle” attachments, and the photo shows the width of the handles at the strap; then expanding, but turning narrower at the bottom. 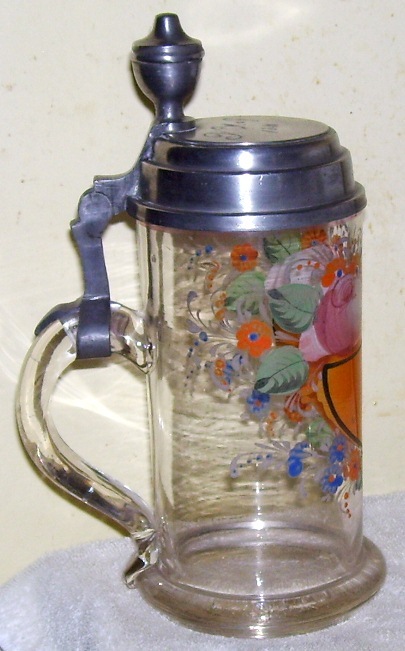 What I feel is an interesting variant, made so by the lid with the finial also acting as the thumblift. 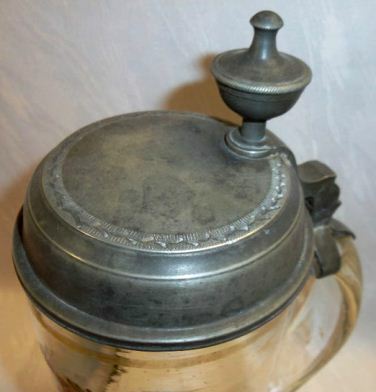 There is a lot of nice small pewter work around the lid. 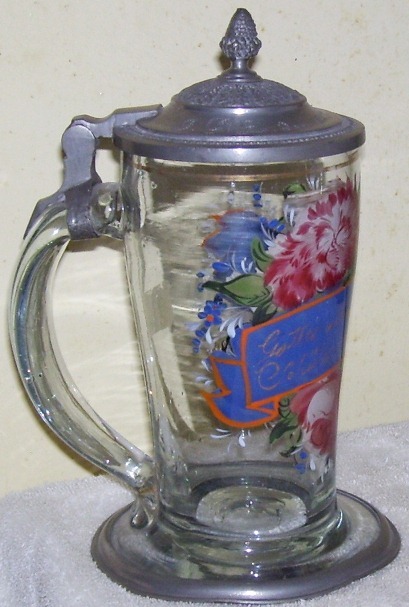 This also has a pewter base rim which is slightly less than common on these steins. Dated April 1842. There was never a thumblift on this piece, the finial served that purpose, as it did on steins in the 1600’s. This shows another closely related (third cousin?) stein to the Saxons. 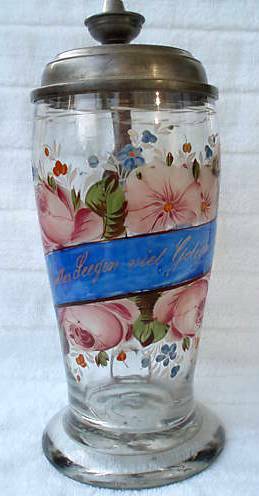 This one is German / Bohemian, engraved and not painted, but also a wedding / loving memorial. Circa 1800- 1840. Just another nice example taken off German eBay in 2008. It might have ended up in “FWTD” had the seller taken PayPal. A later day version, painted on the outside only. Circa 1850 -186o’s . Nice looking =- but no where near as nice as the older ones. 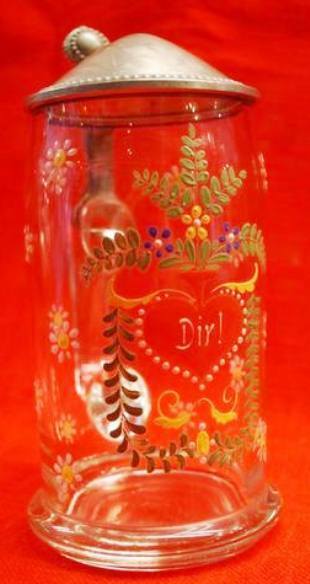 Wedding type steins had digressed to this point by the early 1900’s . A damn shame say I.